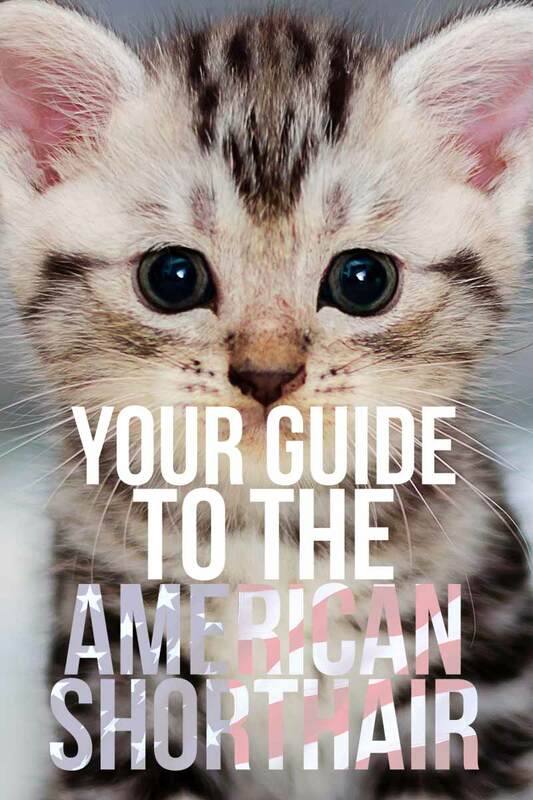 American Shorthair Cat - Is This Your Purrrfect New Pet? You are here: Home / Cat Breeds / American Shorthair Cat – Is This The Perfect Pet? American Shorthair Cat – Is This The Perfect Pet? The American Shorthair cat is a true American classic, and now Shannon Cutts sums up everything you need to know about them. When most people think of America, they think of apple pie and the NFL. When a cat lover thinks of America, the first cat breed likely to spring to mind is the American Shorthair cat. As early American history verifies, the American Shorthair came over with the original pilgrims on the Mayflower, paying for its passage with expert ratting services. Today, the American Shorthair cat truly is considered an all-American cat and is a treasured part of national culture and of families across the nation. And best of all, this cat makes a wonderful pet! Read on to learn all about this fabulous cat breed and decide if an American Shorthair kitten or cat might be your next feline family member! What is an American Shorthair cat? The plain old shorthair cat became a part of early New World culture long before it captured the interest of professional cat breeders. In fact it wasn’t until the late 19th century when newly formed cat associations decided they wanted an all-American “working cat” breed to share at cat shows. They wanted the cat to have a short coat, and guess which cat breed they chose? That’s right – suddenly lovable shorthair cats became the “American Shorthair cat”. And in 1906 the Cat Fanciers Association (CFA) added it to their approved breed roster as their fifth registered cat breed. Since then, these feline heavy weights have lent their genes to many a more recent pedigree, including the fuzzy American Wirehair, and the inky Bombay cat. Today, this cat’s working days are most certainly left behind, and the American Shorthair enjoys the easy life as one of the nation’s favorite pet felines. The American Shorthair cat can differ in weight depending on gender. Female adult American Shorthair cats will generally weigh between 6 and 12 pounds. Male adult cats, on the other hand, can weigh anywhere from 11 to 15 pounds. At maturity, the American Shorthair can stand anywhere from 10 to 14 inches (paw pads to shoulder), with males again being slightly taller than females. Once American Shorthair kittens are fully grown, breeders describe this cat as muscular and balanced. They have medium bones and an overall firm and solid body structure. This cat breed is one that matures slowly – many first-time owners are surprised when their cat keeps growing until three or four years of age! What does an American Shorthair cat look like? The American Shorthair has wide, rounded eyes set slightly apart, and round-tipped ears. These features give them a perpetually good-natured and somewhat surprised expression! This cat has a square jaw and a medium to short muzzle. One of the most exciting things about this breed is the exciting kaleidoscope of patterns and colors these kitties come in. The American Shorthair cat is bred in a wide range of colors. They can have cream or pure white fur, silver, blue, brown, black, red or gold fur. Their markings are often striking – this is definitely a show cat that can and does turn heads! Breeders say the coat texture can vary somewhat depending on the color and pattern. The brown tabby pattern is said to produce ideal coat texture. Often these cats will have two or even three colors. In fact, more than 60 color and pattern combinations have been identified in this cat breed, but the silver tabby is probably the best known and most popular. Eye color in the American Shorthair cat can be blue, hazel, green, gold or a striking copper color. The American Shorthair cat has short hair, but it is also very dense, comprising two layers with distinct and important functions. The top layer is water repellent and thick. The under layer is soft and insulating. Because of the thickness of their coat, these cats will shed year-round and more heavily when the seasons change. However, you don’t need to do anything special to keep your cat’s coat healthy other than brushing it once or twice per week. The American Shorthair is a very intelligent cat who easily learns tricks and loves to play interactive games. Because this is a laid-back and easygoing cat breed, some people think it has a solitary nature, but nothing could be further from the truth. This breed is quite social and will not fare well if left alone for long periods of time. However, short periods of time alone are okay, as this cat is smart enough to do some amount of self-entertaining. While this cat has the strong and muscular physique and street smarts to be an indoor-outdoor cat, the American Shorthair is generally perfectly content to remain indoors. Favorite indoor activities include sunning on a window ledge, watching birds in the trees outside. They might also take pleasure stalking insects that fly inside unwittingly, and following their “people” around. Your American Shorthair won’t be clingy but will like to be close to you. Some of them do become very fond of lap time, while others just enjoy sitting close by. This good-natured breed is often praised for its patience and forbearance. So as you can imagine, American Shorthairs make great family cats! You won’t have to worry about guests scaring your American Shorthair into the closet, either. This cat likes to meet new people and will happily join in the party and make new friends. But although this laid back cat can rub along with visitors children and other pets of all sizes, he will have his limits as surely as we humans do. So always make sure he has a peaceful space to escape to when he needs it, and always supervise very young children as they play with your American Shorthair kitten. Overall, this breed is considered to be a healthy, stable natural cat breed with a lifespan that can reach 15 to 20 years or more. As with any pet, this cat’s daily diet, exercise, enrichment, lifestyle and access to preventative veterinary care can greatly influence how long your cat is with you. Overall, the American Shorthair breed is a healthy cat breed. However, there are no cat breeds today that do not have some genetic predisposition towards certain health issues, and the American Shorthair cat is no exception. 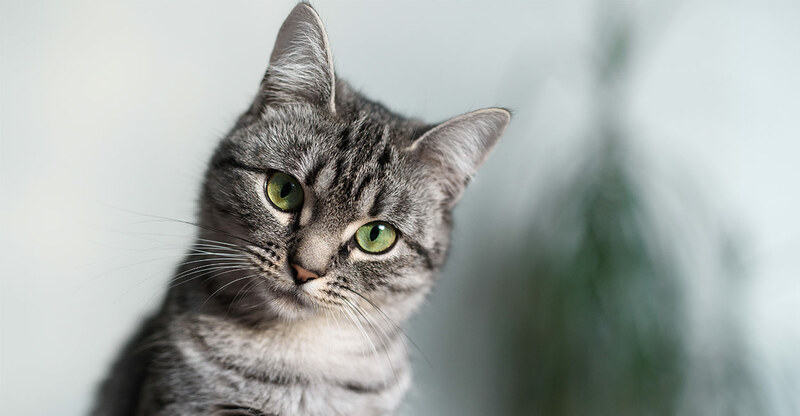 Researchers have identified the following health conditions that crop up in American Shorthairs more frequently than in the domestic cat population as a whole. Because the American Shorthair got its start as a working cat, this cat’s transition to the indoor life of leisure has produced a tendency towards weight management issues. While you can expect your American Shorthair kitten to be active and playful, middle age is when the American Shorthair is in the greatest danger of too much weight gain. Another concern you will need to watch for is overfeeding your American Shorthair kitten. Because this cat breed matures slowly, you must be careful to avoid overfeeding your kitten. Overfeeding can cause too-fast growth and place strain on the bones, joints and muscles. Luckily, you can be proactive about protecting your cat against obesity. Working together with your veterinarian to establish an ideal weight range at each stage of life and feeding strictly controlled portion sizes at each meal to keep them fighting fit. HCM, as this heritable condition is often abbreviated to, causes the heart wall to thicken. When this occurs, the heart struggles to beat and move blood efficiently through the body. In time, hypertrophic cardiomyopathy can lead to heart failure, heart attack, blood clots and death. There is a defective gene that can cause heritable HCM, which can be easily tested for. However, not all cats with the gene will develop the disease, and some cats without the gene can still develop the disease. More research is needed to fully understand how and why hypertrophic cardiomyopathy occurs more frequently in the American Shorthair cat breed. Hopefully this will also lead to more accurate genetic tests. At this time, the best way to reduce the risk of choosing a kitten with HCM is to ask the breeder for proof that the breeding line your kitten comes from is free from HCM. You can also have your kitten tested with an ultrasound to look for a thickened heart wall. Researchers have identified some influence from the Persian cat breed in the American Shorthair cat gene pool. This predisposes the American Shorthair to develop polycystic kidney disease more than some other cat breeds. PKM, as this condition is sometimes called, causes multiple cysts to develop inside the kidneys. The cysts are typically present at birth and can be in the kidney and liver, although they are not always present in the liver. The cysts will get larger over time, until eventually they cause kidney failure. There is no cure for polycystic kidney disease, but an ultrasound test can detect the presence of the small cysts in a kitten with the condition. Breeders can test parent cats for PKD and should be able to provide you with proof that their breeding line is free from this condition. Hyperthyroidism is caused when the thyroid gland becomes overactive. American Shorthair cats can develop benign thyroid tumors later in life. These tumors sometimes interfere with the endocrine system’s messaging system, which can cause the thyroid to keep producing more hormones than the body needs. When this occurs, your cat may vomit, become restless, lose weight and drink more water. 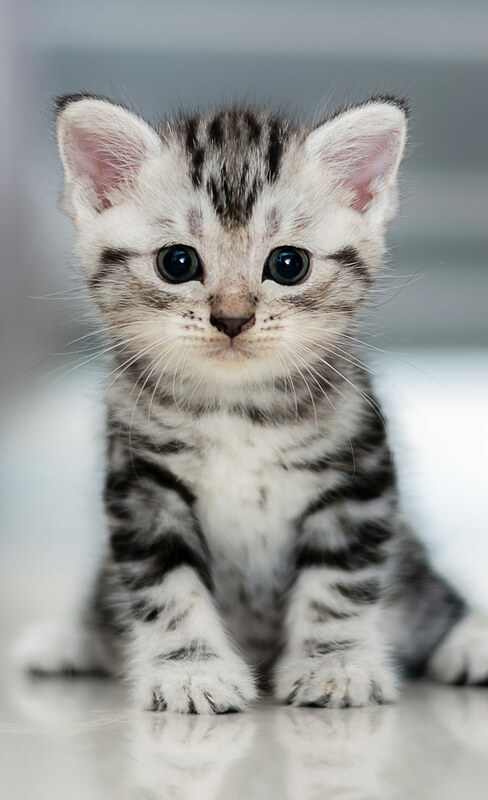 The American Shorthair kitten is as cute as any kitten could possibly get. They have naturally alert, open expressions and look like teensy tigers with their wild markings! It is important to remember that these kittens will mature slowly – some can take up to four years to reach their full adult weight and height. You should always visit a kitten you are interested in in person, and see them with their mom, before you bring them home. This may require flying or driving a distance if there are no breeders in your area. But it will be worth it, since this is a cat you may share the next 15 or 20 years of your life with! American Shorthair cat breeders are relatively plentiful, since this is a very popular cat breed. Any breeder you choose to work with should be willing and able to verify their breeding line is free from all known genetic health concerns. You should also receive an initial health guarantee (typically good for six to 12 months), papers, proof of all required vaccinations. Responsible cat breeders also offer a take-back offer if the kitten doesn’t work out for any reason. You may also want to ask for references, which any reputable breeder should happily provide. American Shorthair cat price tends to range between $600 and $800 for a healthy purebred kitten. However, the price can range up to $1,100 and higher as well, for unusual colors and markings, or a kitten with show-winning ancestry. You may be asked to send a deposit if there is a waiting list for a kitten – generally this is not refundable if you decide not to go through with a purchase. Is an American Shorthair cat right for me? To feline lovers, the American Shorthair cat is as American as cheeseburgers and the national anthem. This cat has been with us since the birth of our country and is beloved nationwide as a wonderful pet for individuals and families. This patriotic breed can find a place within most families, has a friendly well-rounded personality, and most individuals live long and healthy lives. Nothing about them is over-the-top or exacting, they’re simply a pleasure. Which isn’t to say they aren’t a commitment, of course. In exchange for their agreeable nature, these cats deserve loving homes, with owners who have plenty of time to keep them company. We hope this information about the American Shorthair cat breed has helped you decide if now is the right time to bring one into your life. Do you have an American Shorthair cat? What’s the top piece of advice you’d offer to someone bringing home their first American Shorthair kitten? Please share it with us in the comments section below! Fisher, V., “American Shorthair,” The International Cat Fanciers Association (TICA), 2018. Goble, P., DVM, CCRT, “Feline Breed Spotlight: The American Shorthair,” Town Centre Veterinarian, 2016. Lipinksi, M., et al, “The Ascent of Cat Breeds: Genetic Evaluations of Breeds and Worldwide Random Bred Populations,” Genomics, 2008. Lyons, L., “Genetics of Cat Populations and Breeds: Implications for Breed Management for Health!,” University of Missouri College of Veterinary Medicine, 2013.